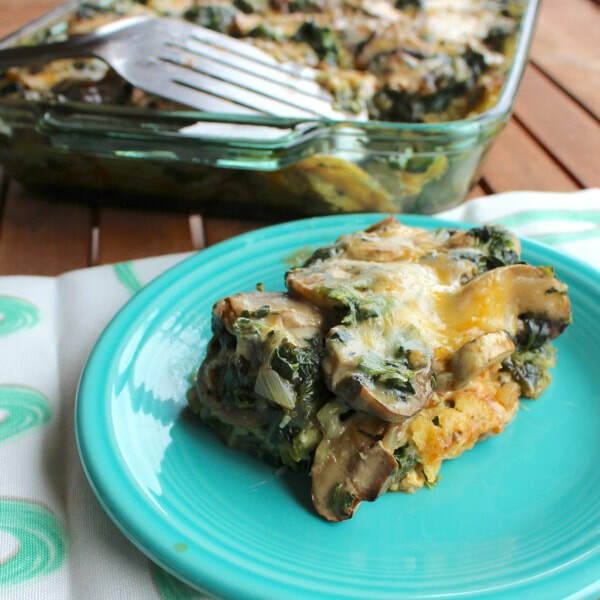 This Spinach and Mushroom Enchilada Casserole is a delicious vegetarian alternative to traditional enchiladas. Looking for similar recipes? Try this One Pan Fajita Chicken Bake or this Crock Pot Enchilada Rice. Pour half of the enchilada sauce into a 13x9 inch baking dish. Arrange 8 tortilla halves over the sauce in the baking dish. When mushrooms are cooked, stir in the oregano leaves and salt (if using). Drain the spinach, squeeze it dry and add it to the mushroom mixture. Spoon half the mushroom mixture into the baking dish, carefully covering tortillas. Set aside ¼ cup (about 1 ounce) of grated cheese. Sprinkle the rest of the cheese on top of the mushroom mixture. Layer with the remaining 8 tortilla halves, then the remaining mushroom mixture and enchilada sauce. Sprinkle top of casserole with the remaining ¼ cup cheese.